People used to address young men as “master.” It was creepy then; it’s still creepy now. Don’t do it. 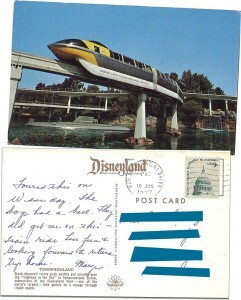 And while you’re at it, write “Disneyland” as one word. 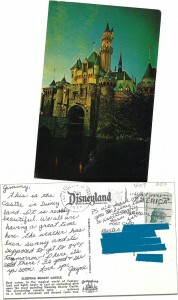 It’s written in giant letters at the top of the postcard you’re writing on, for goodness sakes. 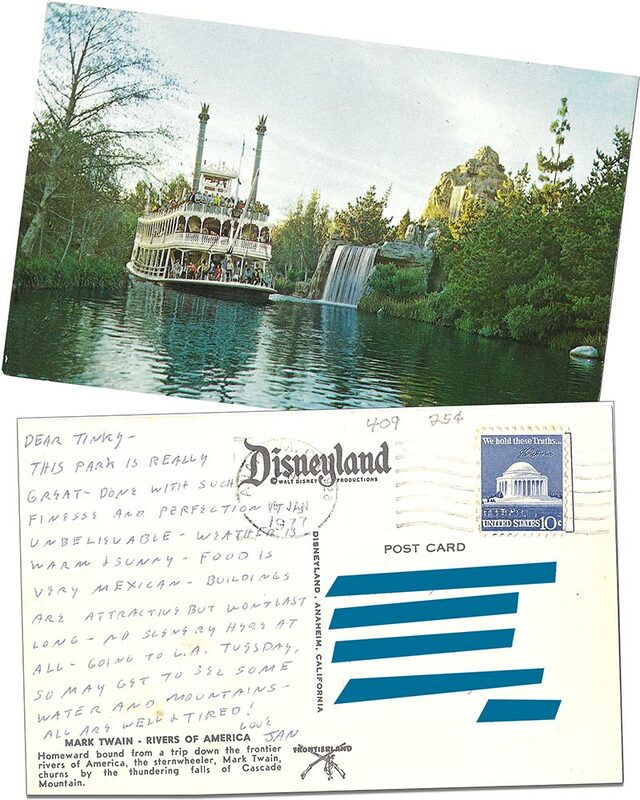 A) Complains that Disneyland has no scenery and hopes to see water and mountains in Los Angeles. 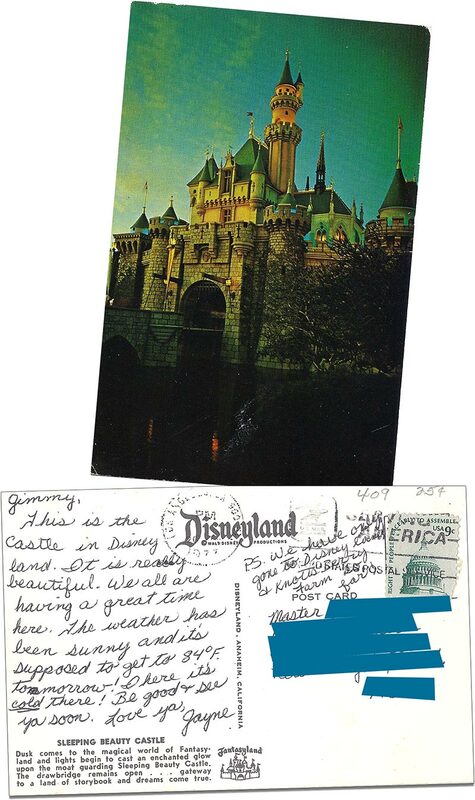 B) Writes this on a postcard with a photo of water and a mountain at Disneyland. 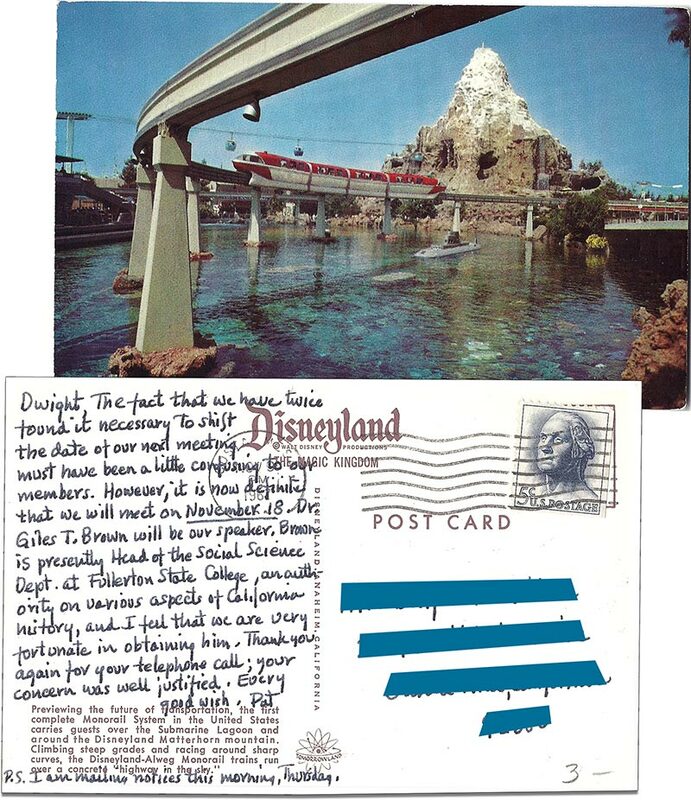 C) Thinks that Disneyland buildings won’t last, but 37 years after the postcard was written, most of the buildings are still there, but the mountain in the picture is gone. P.S. 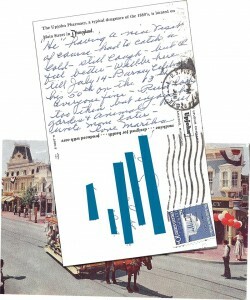 I am mailing notices this morning, Thursday. “He” having a nice visit of course had to catch a cold — still laugh — lest I feel bitter — We’ll be here till July 14 — Barney Celebrated his 50th on the 13th. 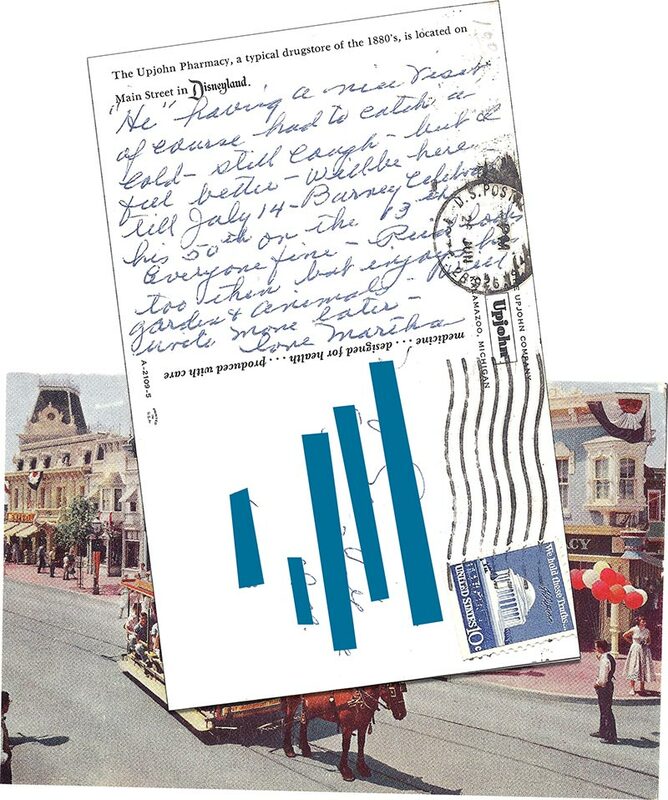 Pretending like you aren’t particularly surprised or bothered by a spouse’s illness, but writing about it on a postcard picturing a pharmacy. 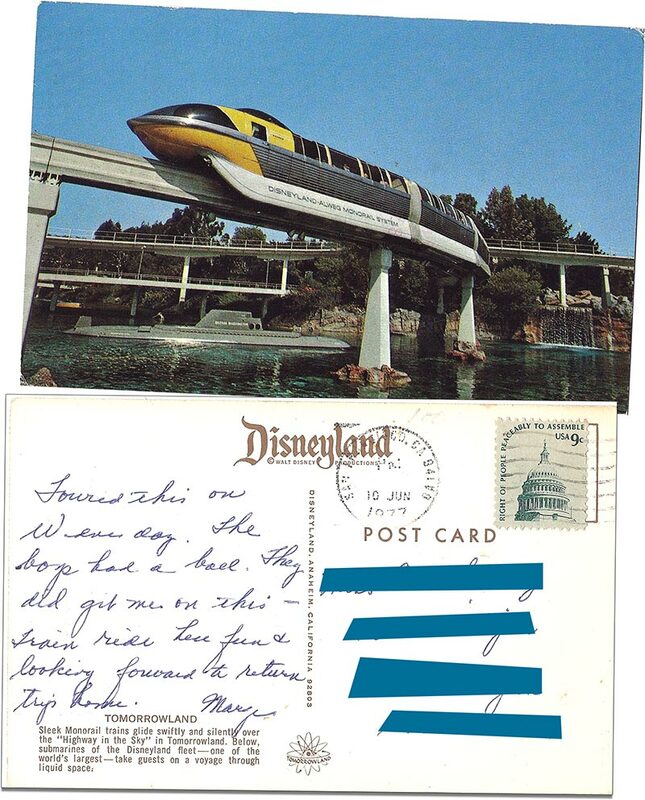 Mary seems to think that she’s going to be taking the Monorail home. 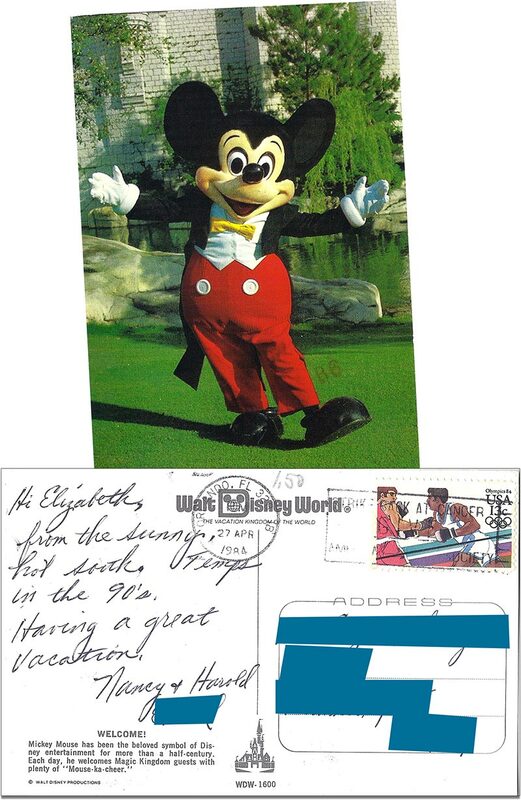 At first glance, you might think that she’s charmingly delusional, but it turns out that she actually lives at the Wilderness Lodge (which — jokes on her — has no monorail service). 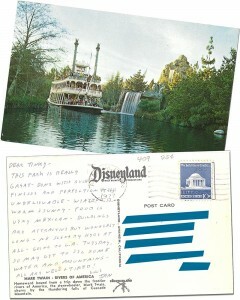 We really want to know where this picture was taken. Is there a gigantic lawn somewhere in the Magic Kingdom? 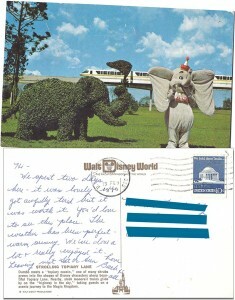 A lawn populated by topiary animals that’s so big that you have to take the Monorail to cross it? Why is it called a “lane” when there’s no path or pavement? 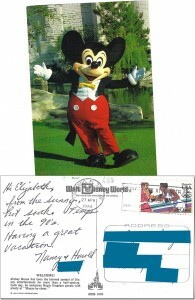 And what is a costumed character doing wandering around out there? Is it lost? 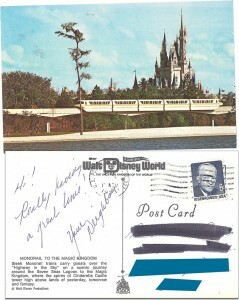 Avoiding giving autographs? On a break? 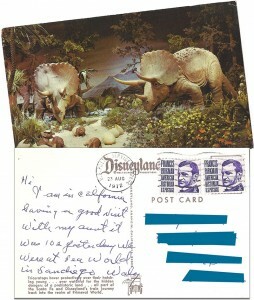 So many unanswered questions on a postcard we couldn’t read most of. Here’s a lesson in manners: Don’t call your aunt “it,” particularly if you’re visiting for her 102nd birthday, and don’t brag about going to Sea World instead of to her party. It’s just rude. Spending 3-4 weeks here + there with my Trailer. 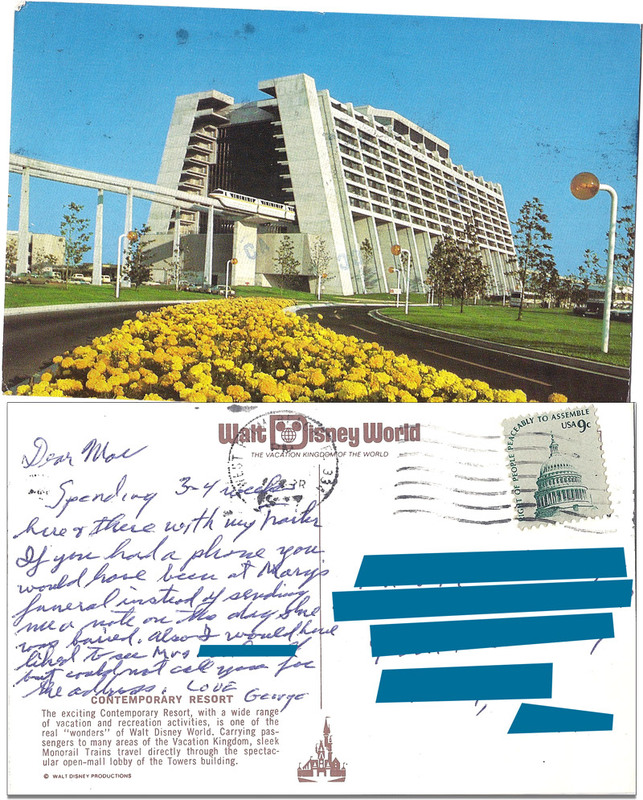 If you had a phone you would have been at Mary’s funeral instead of sending me a note on the day she was buried. Also I would have liked to see Mrs. ___ but could not call you for the address. Wow. Way to criticize someone for not having a phone, Mr. Lives in a Trailer in the 1970s Before Cell Phones Were Invented. Really having a great time! from the sunny, hot south. Temps in the 90’s. The temperature is in the 90s, but there’s still a person running around in a mostly black mouse suit. How they heck can they avoid instant heat stroke? 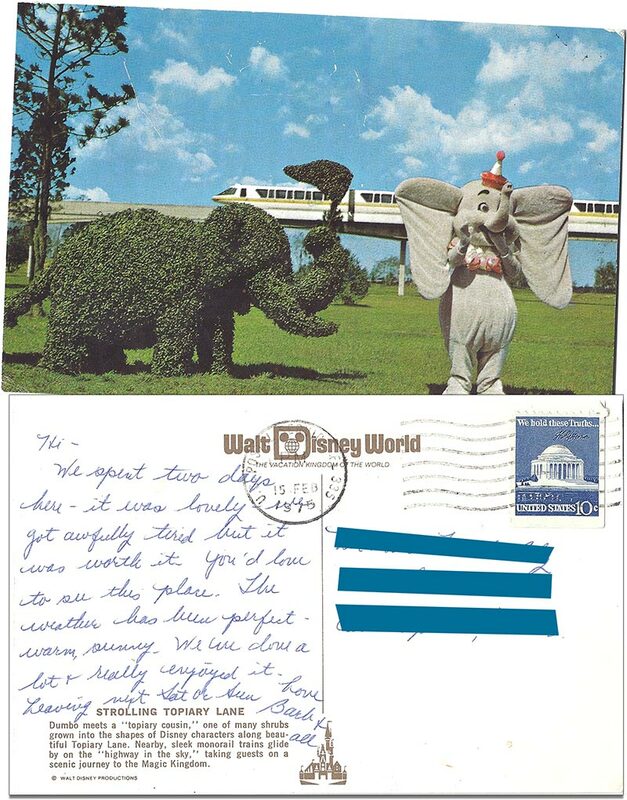 When we visit Disney World during the summer, we always expect there to be costumed cast members strewn here and there all around the place, unconscious from the heat, but we never see any. They must drag them backstage really fast.